Lewis Hamilton will be able to clinch the Formula 1 drivers’ championship if results go his way at the United States Grand Prix this weekend. 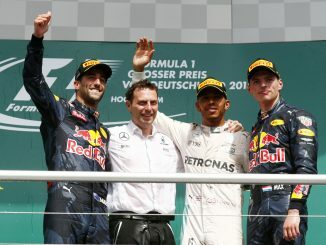 Victory would hand the Mercedes driver his fifth title if anyone other than Sebastian Vettel is second, while any finish in the top six will be enough for the Briton if the Ferrari driver finishes outside the points. 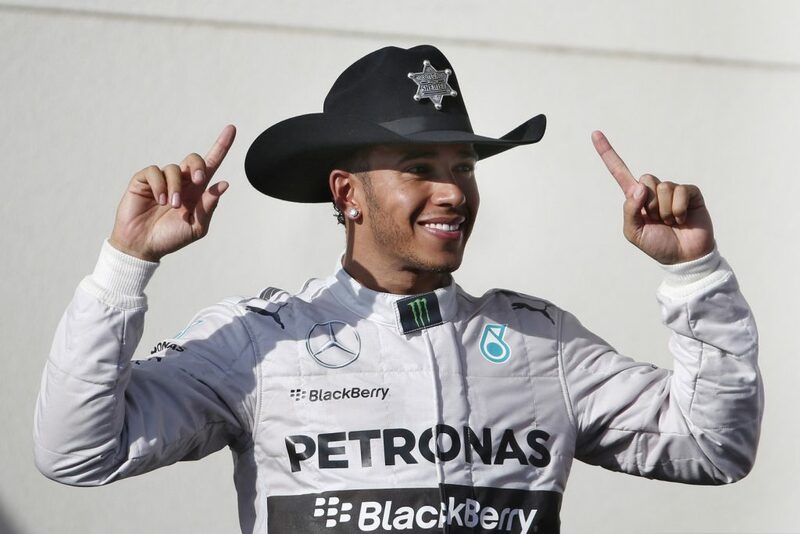 Hamilton heads to this race following six wins from the last seven races. Hamilton started the race on pole position but it was Vettel who took an early lead with a stronger start than his rival. The Mercedes driver was able to retake the lead before the pitstops though, and kept the German driver behind throughout, even after Ferrari tried to make the undercut work, leaving him on the verge of his fourth championship. The race is perhaps best remembered for Max Verstappen’s drive and time penalty. The Red Bull man started towards the back of the grid after taking a hefty engine penalty, but his strong race pace left him challenging for a podium. He attempted to force a way past Kimi Raikkonen in the closing stages, but was found to have left the racetrack and gained an advantage, resulting in a five-second time penalty which was enough to hand third back to the Finn. Verstappen wasn’t the only one taking penalties, as a total of seven drivers being handed grid drops. 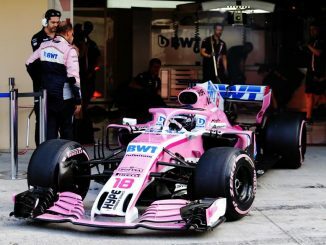 With so many drivers taking penalties, Lance Stroll managed to rare feat of finishing qualifying in 17th, taking a three-place penalty, and starting the race from 15th due to others around him also having penalties. There was a new look to the driver lineup at Toro Rosso and Renault for this event last year. Carlos Sainz made his debut for Renault after switching from Toro Rosso, which made way for Brendon Hartley to have his first outing for Red Bull’s sister team. Daniil Kvyat was also back at Toro Rosso after Pierre Gasly took his spot in the previous race, but it turned out to be the Russian’s final race for the team (at least until the 2019 Australian Grand Prix) as his contract was terminated following the trip to the Circuit of the Americas. 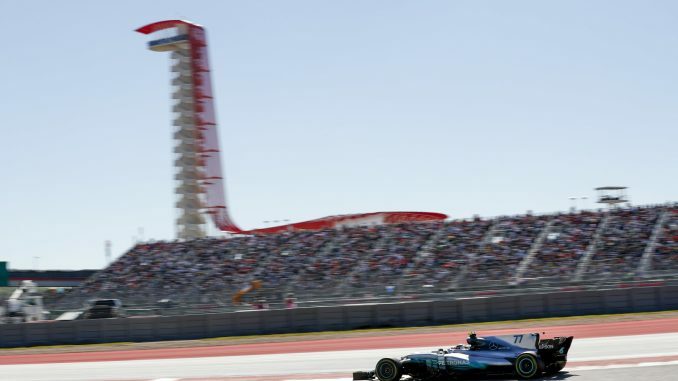 A few changes have been made to the track since last year’s United States Grand Prix. The FIA announced at the start of the year that new kerbs would be installed for this race in a bid to prevent drivers from cutting corners like Verstappen did last year. There’s also been work to smooth bumps out of the surface of the track following complaints from Moto GP, which also races at the circuit. However, riders were very critical of the new surface when they raced their earlier this year. A diamond grinder was used in a bid to take the bumps out of the track, but this left the circuit very dusty. Several months have passed since, so the dust should have cleared by now, but it does mean the profile of the track will be slightly different in some places to 2017. One of the two DRS zones has been lengthened this year, giving drivers longer to open the flap on their rear wing between turns 11 and 12. 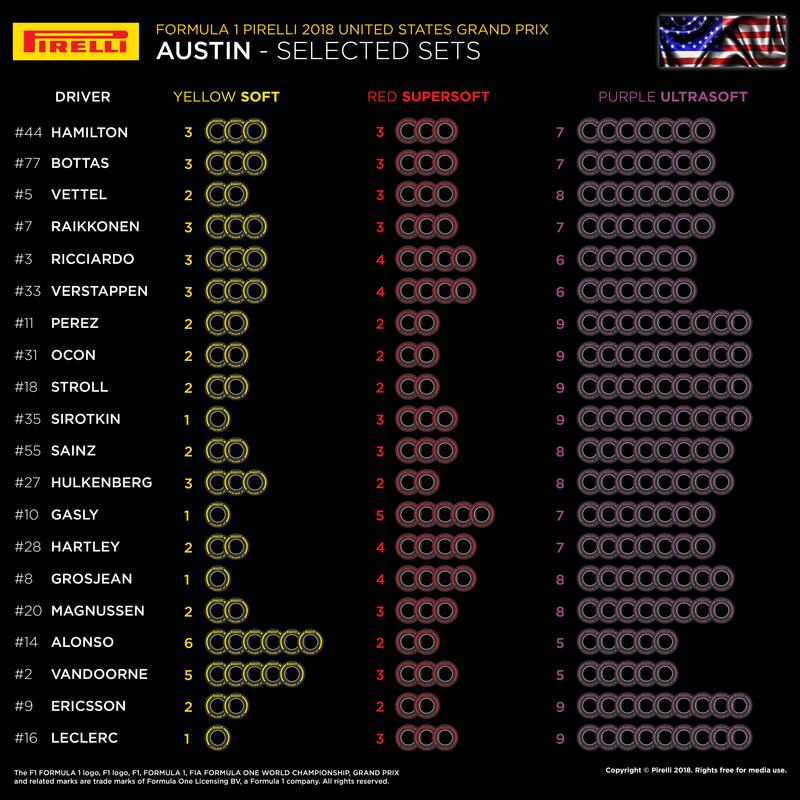 Pirelli will be bringing the soft, supersoft and ultrasoft tyres to this race – the same compounds that were in use at COTA in 2017. Most drivers used a one-stop strategy last year, starting the race on the ultras before switching onto softs for the second half of the race. Vettel tried a two-stop strategy in a bid to close the gap to Hamilton in the final stages, using all three compounds during the race, while Verstappen also made two trips into the pitlane as he charged through the field. The front runners have split their tyre strategies for this race. Mercedes have given Hamilton and Valtteri Bottas seven sets of ultrasofts, while Vettel will have more and the Red Bull drivers are bringing fewer, hoping that the supersoft will be the better race tyre. 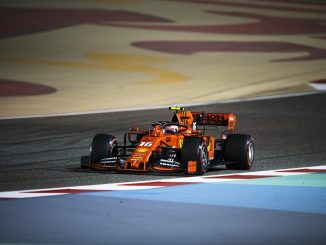 McLaren have gone with arguably the most conservative tyre strategy, having done so for a few races now, while a couple of teams have gone with nine sets of ultrasofts, banking on the softest compound being the one to give them the best pace for qualifying and during the race. At the time of writing this preview, a flash flood warning is in operation in Austin, and it looks like the rain could be sticking around for a couple of days. Friday’s practices look all-but certain to be affected by the weather, with heavy rain forecast throughout the day. This has caused problems before at COTA, both with the way the track dries, and with the ability for the medical helicopter to fly. Saturday also looks set to be a wet one, particularly around qualifying, but Sunday is forecast to be dry and possibly even sunny! Wet conditions throughout practice and qualifying could affect the way the teams set the cars up, and could mean drivers are heading to the race with little to know information on how the slick tyres work around the track. With Hamilton able to win the title at this race and Vettel needing a good result to keep his hopes alive, expect to see team order, particularly at Ferrari and Mercedes. Hamilton is dominant at this track, and if he can get pole position, Bottas holding onto second would be enough to hand his teammate the title. Hamilton really does like this track. He’s won five of the six races held at this track since it opened in 2012. Given his recent form, it’s hard to see anyone else standing much of a chance around here this weekend, particularly if qualifying is wet. There have been a couple of races in recent months where conditions have been changeable during qualifying. Mercedes have typically found the answers, while Ferrari always seem to get the tyre call wrong when it matters. The McLaren drivers probably won’t be too unhappy if they spend a bit of extra time in the garage this week due to the forecast rain. Fernando Alonso heads to this race after taking part in WEC’s 6 Hours of Fuji last weekend, while Stoffel Vandoorne has spent two days testing in Valencia following the announcement that he’ll be moving to Formula E at the end of this season. Although Verstappen and Daniel Ricciardo both seem to enjoy COTA, this isn’t a good track for Red Bull. The team has only once had both drivers finish in the top five in Austin, and that was back in 2013, when Vettel took his only win at the circuit. Qualifying isn’t everything at COTA as Verstappen proved last year, but the winner of this race has always started on the front row. The pole sitter has taken victory on three of the six previous visits to Texas. Expect plenty of glitz, glamour and celebrity guests at this race. 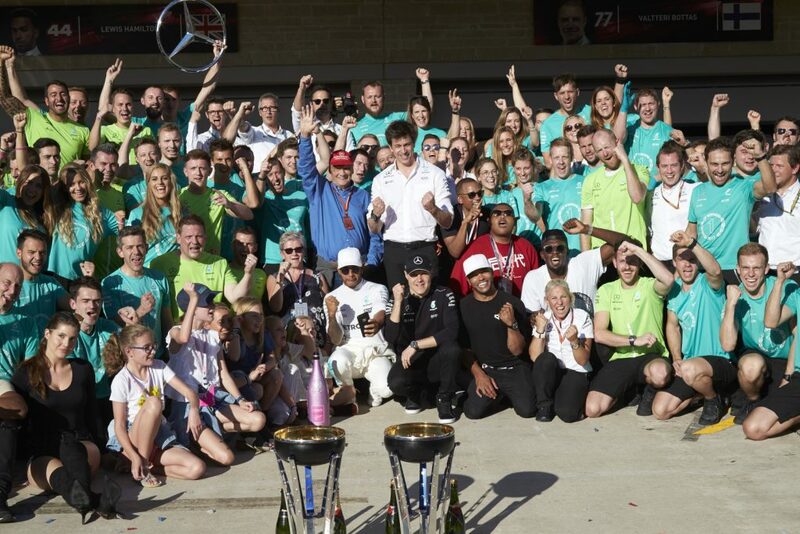 Last year saw the drivers introduced to the track by legendary boxing announcer Michael Buffer, while sprinter Usain Bolt was on hand to start the race and former US President Bill Clinton presented the trophies. You can hear more about our thoughts on this race on this week’s podcast episode, and check out our predictions as well as having a go at your own. We’ll have live blogs during qualifying and the race, and you can let us know what you think through Twitter and Facebook.